Hampton Rovers skipper Christian Carnovale capped off another great year by winning his second straight club best & fairest – the Bob Cave Medal – at Thursday’s Presentation Night. It was a fantastic evening at The Brighton International with over 190 people in attendance making it the biggest end of season function for the club in it 89-year history. Carnovale finished the year on 122 votes, with Ant Folino second with 73 votes and Josh Pavlou third with 70. It was another dominant year for the Rovers captain, leading his team to the Grand Final and earning promotion for the club back to Premier C for the 2019 season. After travelling with the VAFA to Ireland following the 2018 season, he again represented the VAFA this year, in their win over the WAAFL and also made his debut for the Sandringham Zebras. After receiving his award, Christian made a great speech about the season gone, the pain of the Grand Final loss and the hunger for 2019. Tim Jones won the Dom Devola Medal for the Reserves B&F while Adam Power claimed the Thirds best and fairest award. The McGregor Medal for the Under 19 B&F was won by Benji Audige and the Mark Johannsen Memorial Trophy was awarded to Jack Garrow. For the Women, Chloe McLaren won the Sue Anderson Medal for the best & fairest and the Jodie Combe Perpetual Shield for the best first year player was won by Carla Hewitt. The night kicked-off with some big club awards, with Life Membership awarded to Tim Wilson and Miranda Marron – two very deserving recipients. Read more about the two inductees here. The Best Club Person award was presented to Jamie Stanfield who has done a mountain of work throughout the season to ensure the club can field five senior teams and each match day runs smoothly. 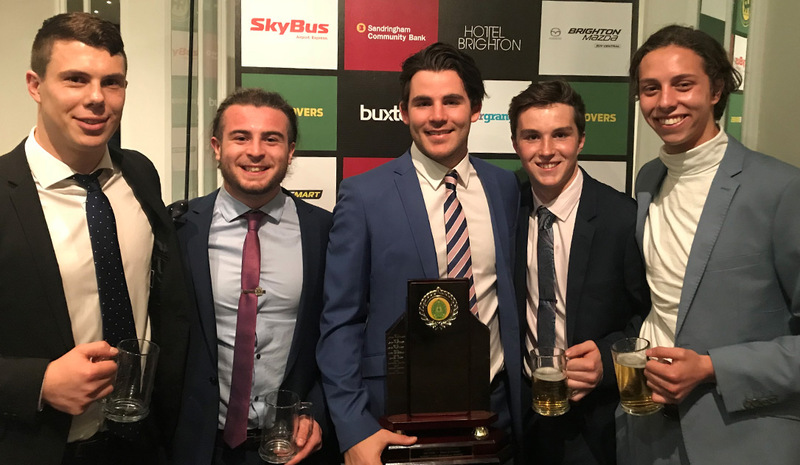 The club also presented a special award to two players who go the extra mile – Lachie Wheeler and Nick Jackson, who after playing in the Reserves, help out by running water for the Seniors without fail.